When Oxford resident Bettye Butler (BAEd 17) decided she was going to finish her bachelor’s degree after a 38-year hiatus from the University of Mississippi, she picked up the phone one morning to ask about her remaining few credits. “I’m not a quitter,” she told Billy Crews, development officer for the UM School of Education. Days later, after a little digging and transcript analysis, Butler learned from Crews that due to shifts in university curricula and degree requirements since her last enrollment in 1979, she no longer was six credits short of qualifying for a bachelor’s degree in education. Education Dean David Rock could authorize her graduation based on her existing credits. 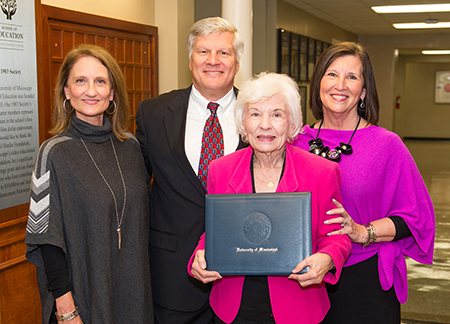 Butler, 87, was presented her Ole Miss diploma by Rock at a private ceremony Dec. 1 in Guyton Hall, with her children and friends by her side. The presentation of Butler’s degree brings the total number of UM degrees in her immediate family to eight; it’s even more if you count her grandchildren, she is quick to point out. The Butler family has deep roots in the Oxford and UM community. Bettye and her husband Jim (BSHPE 53, MEd 62), former director of the Ole Miss Alumni Association who passed in 2013 at age 86, first came to campus as a couple in 1961, when they moved into temporary housing in Northgate Apartments. Jim, who played football for the Rebels as a freshman guard in 1944 before serving in the U.S. Army during World War II and returning to UM to finish bachelor’s and master’s degrees in education, was returning to Ole Miss to begin a career in the Alumni Association as the alumni secretary. Before joining the LOU community as a couple, the Butlers ran a small family restaurant in Pontotoc and later moved to New Albany, where they started a family and Jim worked as a teacher, coach and principal. In 1962, the Butlers bought a house on Bramlett Boulevard – the only house for sale in Oxford at the time, Bettye said – and there they raised three children: Carole, Mitzi and Lance. The Butlers were an inseparable pair during their 64 years of marriage. During Jim’s tenure as alumni director, the association grew by more than 7,000 members and the Butlers traveled the nation as a team, visiting almost every state, to promote and grow the organization. Bettye is the School of Education’s newest alumna and has plans to hang her family’s latest Ole Miss diploma on the wall of her home this holiday season. For original UM new release and other university news, click HERE. Bettye Butler is a life member of the Ole Miss Alumni Association. Bettye, Ole Miss thanks you.